The use of LNG (Liquefied Natural Gas) as a cheaper and less polluting alternative to diesel for generators providing the power to remote sites is becoming increasingly widespread. With many thousands of sites throughout the world, oil and gas drilling industry companies are among the operators who have introduced the technique, which involves the use of specialised trailer-based plant to deliver, store and process the gas prior to combustion. LNG is transported to site in specially designed tankers which also store the liquid gas at the cryogenic temperature of -162º Celsius. A separate trailer, housing the re-gasification system, normally sits between the tanker and the generator. The main component of the re-gasification system is the vaporiser, which converts the LNG from liquid to gas and feeds it to the point of use. This system, together with auxiliary processes including pressure building in the tanker to improve flow, utilises scores of valves which are typically small, cryogenic and tightly arranged within a compact installation. 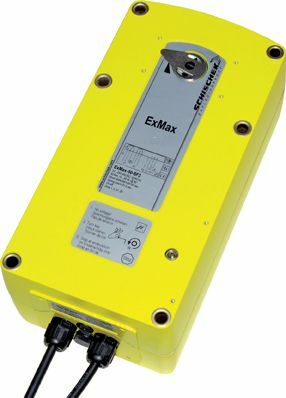 Those valves that are automated therefore require a particularly compact and fast acting actuator, capable of providing powerful rotary or linear drive, for isolating and modulating duties in a hazardous environment. This is a scenario that is proving to be ideal for the Rotork Schischek range of electric actuators, due to their small size, flexible power supply range, failsafe capabilities and explosionproof approvals. An increasing number of ExMax (quarter-turn) and ExRun (linear) actuators are being supplied to OEMs and fabricators in these areas and in other process applications handling LNG in cryogenic environments. The Schischek self-adaptive universal power supply has a range of 24 to 240V, ac or dc. Explosionproof certification for Schischek actuators encompasses UL, CSA, ATEX, IECEx, GOST/RTN, INMETRO and KOSHA international standards, with safety integrity levels up to SIL3 also available with failsafe products. Valve stroke times are suitable for fast operation and selectable at speeds between one and 120 seconds, depending on actuator model. All models are fitted as standard with internal heaters enabling cryogenic operation at ambient temperatures down to -40C Celsius.